WorldMovieStore - The Adjustment Bureau Sinopsis. Matt Damon is doing things a lot of top movie stars are sometimes scared to do: spreading his image thin among a range of roles, directors, and material. Unfortunately, David takes some liberties with his fate that don't correspond with the narrative laid out by "the Chairman," the entity in charge of the Adjustment Bureau autocrats whose matching fedoras are none-too-subtle symbols for wings. The movie evades any mention of religion, but those hats and references to the Chairman are huge winks. John Slattery, Anthony Mackie, and Terence Stamp round out the uniformly excellent cast headed by Damon and Blunt, and with the slick production design and inventive effects, the glossy performances go a long way in adjusting up any dramatic shortcomings The Adjustment Bureau may have improperly calibrated. --Ted Fry. Read More Sinopsis. 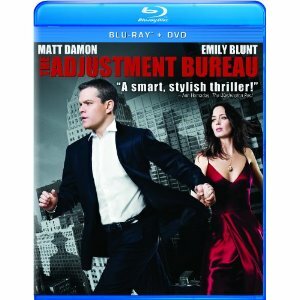 0 Response to "Blu-ray Release The Adjustment Bureau"